An Abstractionist Caught in Nature’s Lure. Candy Spilner was four years old when her mother first gave her paintbrushes and oil paint. This set Spilner on an artistic path that took her to the School of Art at Cooper Union in New York City. Emerging with a Bachelor of Fine Arts degree in 1972, she has been a painter for the past four decades. For many years, Spilner’s work was characterized by large, square-shaped figural paintings. These evolved into works that were at once abstract and representational. While over time, abstraction became more and more dominant in her output, vestigial influences arising from figural and landscape elements continue to shape the layered structures that are her paintings today, giving them life and movement. An intense and vivid use of color imparts even more vibrancy. When you view her paintings, you think of archipelagos seen from high in the sky – island formations seemingly powered by a biological force. She began summering on the banks of the Delaware starting in 1986. By 1989, she migrating from New York City permanently. Spilner became intrigued by driftwood thrown up by the river of her new home. She painted on their surfaces directly. And they also inspired freestanding paintings. She was further inspired by the rocks of Chinese scholars which she saw in a visit to New York City’s Metropolitan Museum of Art. These catalyzed painterly idea after idea. Nearly a hundred years ago – in 1917 to be exact – the great modernist collagist and sculptor Jean Arp was in Ascona, on the bank of a lake in Switzerland. Describing a breakthrough similar to Spilner’s epiphany, he wrote, “In Ascona, using brush and ink, I drew broken-off branches, roots, grasses and stones which the lake had washed up on its shore. I simplified these forms and unified their essence in fluid ovals, symbols of eternal mutability and of the becoming of bodies.” The forms Arp discovered in 1917 became for him “decisive forms” that in the world of art came to be known as biomorphic. A fascinating feature of classical Modernism was the inability of many of its pioneers to depart from representational and figurative art. As much as they wished, they could not do it. Not only Arp, but many others refrained from total abstraction. Waylaid by the lure of biomorphic shapes, they realized that the quest of pursuing pure fantasy was not as satisfying as it appeared. Think of Picasso, Matisse, Kandinsky, Kupka, Miro and the Armenian-American Arshile Gorky. 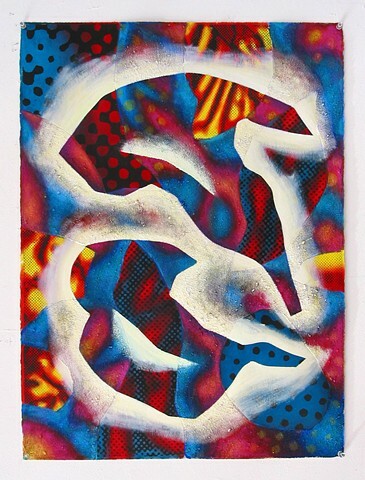 Biomorphic and even figurative images so informed their visions on canvas, one concludes that nature bent these artists to its will, in spite of their wish to be totally original. Spilner, too, found this to be so in the course of her artistic journey. While she has left figural painting far behind, the things of this earth have continued to keep her spellbound. Their essential forms and shapes are still her basic inspiration. To this must be added another element of the artist’s life experience. Spilner and her partner, Allan Rubin, are world travelers. 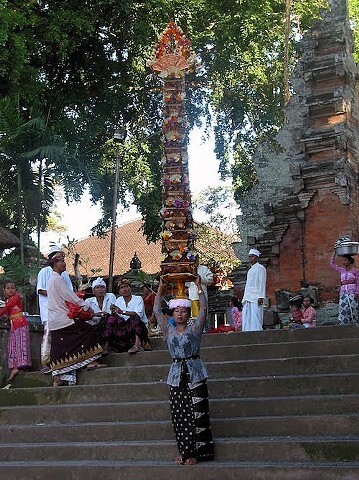 Having visited European and Latin American countries, they began to spend a lot of time in Asia, especially Bali in Indonesia. It is not only newfound colorful landscapes that influence her work; the spiritual and cultural life of Bali’s people have given her visual vocabulary a teeming vitality. Those scholars’ rocks Spilner saw in the Metropolitan Museum have been transformed by these influences into vivid, layered paintings that one can contemplate for hours. 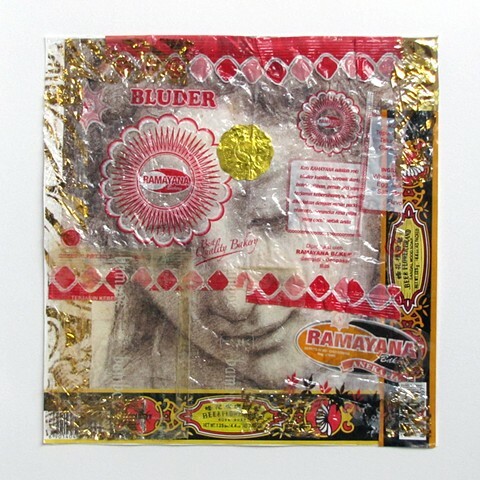 Consider “Sekala and Niskala”, an oil, sand, and photocopy-on-board construction Spilner made in 2011. What social drama is being enacted by the animal-like images this painting embodies? Is this a scene from a folk-art play? Or are the images pointers to a primordial natural force? Or regard “Sanggalangit”, which Spilner made in 2014 with oil, artificial flowers, gold leaf, and sand on board. Consider the Javanese-inspired motif Spilner embodied in this painting. Is she representing a social idea? Or has she created more of a biological or even geographical construct? Or are all these things conflated within a single, self-organizing ecology? Maybe the world of the painting contains all of these realities. An artist Spilner admires, Brice Marden, during his half-century career, has moved from a Minimalist kind of Abstract Expressionism to a form of abstraction, internalizing a biomorphic approach to imagery. Riffing upon Chinese calligraphy, he has begun painting circuitous, interloping bands that at once create balance, cohesion and an animating vitality. Spilner achieves a similar synthesis. In 2009, New York’s Guggenheim Museum mounted an eye-opening show called “The Third Mind: American Artists Contemplate Asia, 1860-1989”, which vividly illustrated the influence that Asian art, literature and philosophy have had on American artists from the late nineteenth century through the twentieth. Interaction between American and Asian art is still evolving – as a similar symbiosis unfolds with other parts of the world. A global art is coming into being. In 2013, a British Museum show tried to demonstrate a great artistic flowering occurred during the last Ice Age. Between 10,000 to 40,000 years ago, this output may have been a response to an existential challenge unleashed by a climate change crisis. Maybe today’s global challenges – arising from climate change, as well as other environmental and social stresses – are engendering a global art. Painting in a large, light-filled studio on a hillside overlooking a valley close to her beloved Delaware River, Candy Spilner, an abstract artist entrapped by nature, is acting locally but participating in a great global adventure. “I love it here,” said artist Candy Spilner. “Until two years ago we were going back and forth to NYC on a regular basis, but now we’re up here full time.” For Spilner, the other half of “we,” is her long- time partner, artist Allan Rubin. Spilner has been traveling the globe, searching for inspirational cultures and places. 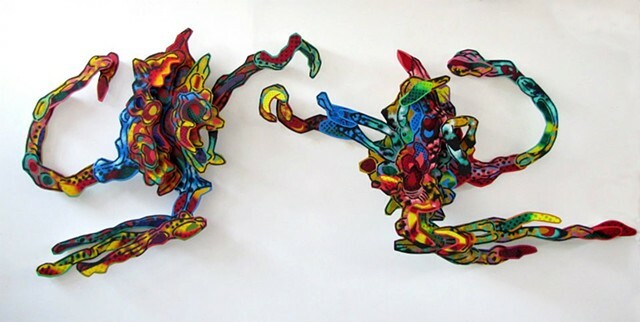 Her visit to Ecuador and Galapagos in 2001 left the artist “deeply affected by the variety of spectacular landscapes and the vibrant culture.” Her visit to Bali in April 2005 was a similar experience. Experiencing the Balinese love of music added to her delight. Spilner has created a series of photos and paintings from her travels. Her latest travel collection is based on her visit to the ancient culture of Sicily. Spilner’s personal journey has taken her from Westfield, NJ to a hillside studio in upstate NY. After graduating from the Cooper Union School in Manhattan, Spilner began working as an artist’s assistant for Tom Wesselmann. Working for Wesselmann led her to the peace and beauty of Sullivan County. By 1989, she bought a home with Rubin in the picturesque hamlet of Cochecton. They also share a website, www.spilner- rubin.com. Spilner enjoys the area as it has so many other artists and venues for exhibition. As she’s been living upstate full time, her work has been more available in such Sullivan County locations as the Alliance Gallery in Narrowsburg. Onto the emerging shapes she adds brilliant color, wearing out her brushes on the rough sand. Spilner wants viewers to feel they’re “watching the paintings rather than looking at them.” The artist hopes that her contrast of glossy and gritty surfaces create a sense of oscillation and movement, causing the colors to appear to be emerging and receding at once. The artist has also exhibited a collection of nudes. Using black and white photos as the basis of her composition, she renders monochromatic studies of each subject. “In all of art history, the human figure has always been the most compelling subject,” says her statement. Her personal journey is reflected in her art. In all of art history the human figure has always been the most compelling subject, weaving in and out of other subject matter including abstraction. When I lived in NYC I painted figures in interiors. When I stayed on the Delaware River I painted figures in water. In my studio on a hill in Cochecton, the figures moved to inhabit abstract landscapes which then evolved into fanciful visions of mountains and streams. In the current paintings the figures and mountains have in a way merged. The constructed shapes are derived from landscape elements, specifically unusually shaped rocks, and driftwood. They refer to the figure with gesture and scale and a suggestion of movement. In these paintings the landscape is striking a figural pose. In front of my paintings I feel like I’m looking into a mirror. I want to strike a similar pose, maybe standing on one foot and twisting with an arm in the air. I want the viewer to have a similar desire, to dance along with the paintings rather than just looking at them. The titles are chosen from names of places I have visited in Bali, Indonesia. The words are musical, and along with the paintings reflect the exuberance of the culture I have experienced there. Here's what I made in Batulumbang, Bali. I brought scissors and glue, and picked up trash from the roadside and beach. The fishermen wanted to know why I was so interested in garbage. "Do all tourists like rubbish?" Once I picked up a really cool little mask near a temple and brought it home. I thought was a Hindu thing. I showed it to Wayan and asked what it was. "Oh! Tinky Winky, Teletubby." We had a good laugh. There where plenty of Marlboro wrappers, but I never picked one up. Unfamiliar labels were more evocative and useful as materials for art. When I realized what the little mask was, I tried, but just couldn't see it in the same way. It had lost it's charm, and I threw it away. be a requirement for growth. paint on with sand and cut up photocopies glued to watercolor paper. paintings rather than looking at them. I'm back in NY, but my thoughts are still in the air, halfway between here and that last rice field. I woke up at 3 am thinking about the farmer. He was a stick man, so thin I could see all his bones and muscles. 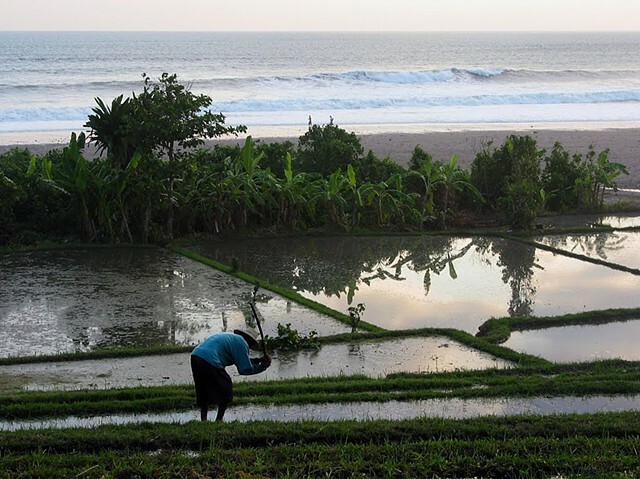 His fields were between our bungalow and the surf. He worked from dawn till dusk, hacking away with a long knife, dragging a log around in the water by a rope, scything grass and stirring it into the paddy. He took the palm leaves off the little nursery bed of rice, and it glowed a brilliant emerald. At the end of the day he chopped an armful of greens from a little side garden and left. He was back the next morning, sharpening his long knife. I can still hear it whacking the mud. This morning I went into the studio to try and work, but my head is so full of other colors...those tube paints seem so dull. Right now I would require radioactive colors to work. I think I'm better off working in my own garden until Bali wears off a little more. Small green coconuts, apples, bunches of bananas, salak fruit with skin like a snake, Bali oranges, sweet rice cakes, purple, orange, blue, yellow, red and white flowers arranged with sprays of cut and woven palm leaves, eight roasted chickens, crowned with betel, a gold foil fan, and blooms bouncing on bamboo stems. This lady glided slowly, gracefully through the split gate of the temple and down the stairs. Five men rushed over to lift the magical universe from her head. She came and sat next to me in the shade, and I congratulated her with grins and hand signals. She was gleeful, dressed in her traditional best, panting and wiping streaming sweat from her face. She explained how important this celebration was, something about the full moon, and once a year and other things I didn't get, but her excitement and happiness were clear and contagious. Later, after a night of music, ritual dancing, socializing, gambling, tasty treats, prayer and general hullabaloo, after much sprinkling of holy water, after the essence of the offering has been consumed by the God, the tower goes back on her head, through the gate and home for a family feast. 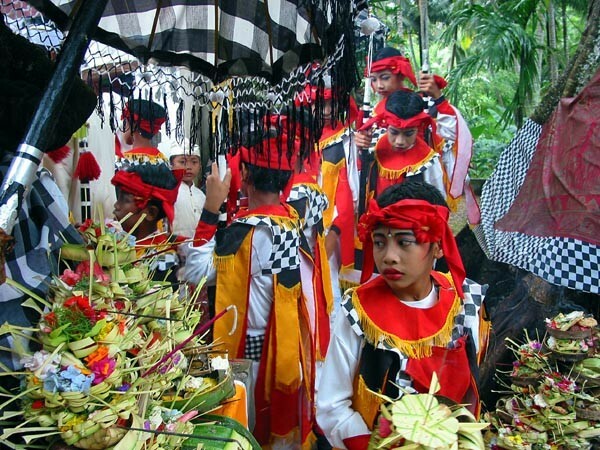 For us, a taste of Bali fascination. our world, it requires complexity, contradiction and diversity. "When the art object contains a wealth of varied materials, it can act. So my show is called MATERIAL MATTERS.